1 of 2 Place pumpkin seeds on a microwave-safe plate and cook on high until theyre golden brown, about 2 minutes. Reserve. 2 of 2 Place vinegar and yogurt in a large mixing bowl and stir together. 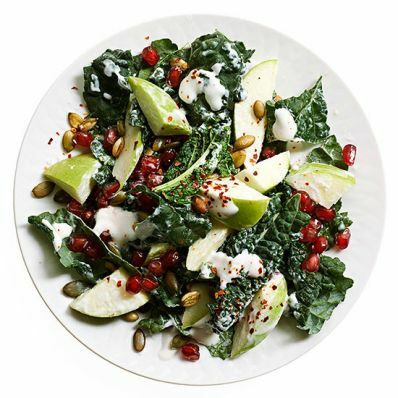 Put kale, apple and pomegranate seeds in a bowl, toss together and add pumpkin seeds. Season with salt and crushed red pepper flakes.